Diamond T are primarily known for their trucks. Founded in 1905, Diamond T specialized in heavy trucks and continued producing things like semi-tractors until 1967 when they merged with the Reo Motor Company to become Diamond Reo. They also produced some lighter duty pickup trucks. The Model 85, and more so the Model 201. were beautiful Art Deco pickups available from the mid-1930s through 1949. But the vehicle above is not a pickup truck. It’s a woody wagon and Diamond T only built three of them. The first was built in 1938, the last was built in 1946. And in 1945 they built this one for company founder C.A. Tilt. This car has script on it that says “Diamond Traveler” so that’s probably what they called it, but it never made it to production. It’s powered by a Continental straight-four engine and features a three-speed manual transmission. Of the three distinct Diamond T wagon prototypes built, this is the only one known to still exist. Expertly restored, it should bring between $45,000-$65,000. Click here for more info and here for more from Mecum. 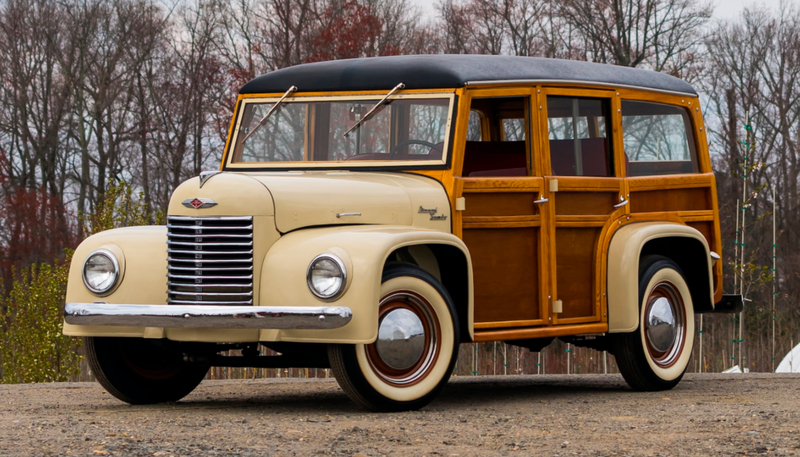 This entry was posted in Uncategorized and tagged 1945, auctions, cars, classic cars, classic trucks, diamond t, mecum, wagon, woody by classiccarweekly. Bookmark the permalink.